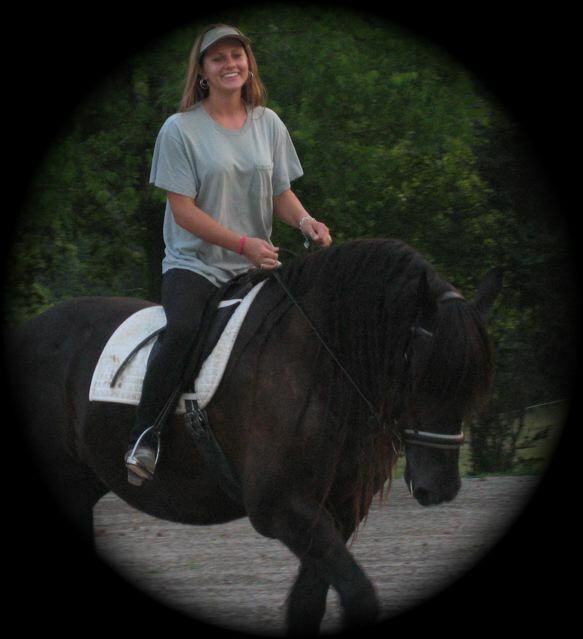 Fimke D is a lovely, elegant, quality Friesian mare. 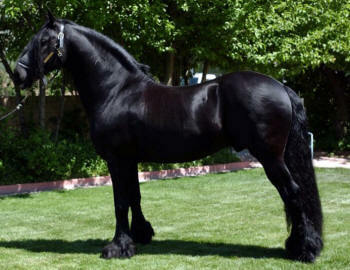 She has all the Friesian characteristics blended with femininity and elegance. Fimke has the most perfect head, throatlatch, neck and shoulder conformation of any Friesian I have ever seen. She has a kind, sweet, calm, generous nature that is always cooperative n anything you ask her to do. She has been an excellent mother and her foals not only receive her exceptional front end and they have the most wonderful temperaments - they are truly friends for life. Fimke's sire is the permanently approved KFPS stallion, Remmelt 323. 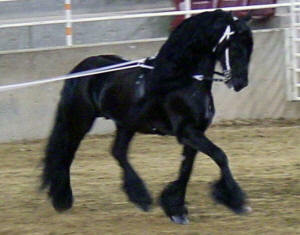 Remmelt was a tall 16.1 hand very black radiant stallion known for his light-footedness, power and luxurious hair. He received very high marks at his stallion testing and had the hiest overall total score of all stallions approved that year. His scores read: 8 for trot; 7 for canter; 7 for under saddle test (dressage); 8 for driving; 8.5 for show carriage test; 9 for character; 10 for stall manners; 9 for training report; with a total of 79 points. The judge's comments were "Remmelt has much radiance and potential to become a great performer." 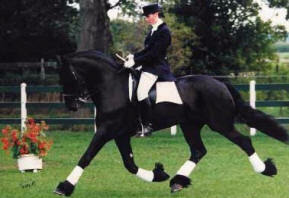 Remmelt was a top dressage horse and competed at "ZZ" Level (Fourth Level) in Holland. He placed 13 out of 15 competitions against top national warmbloods. He was also a very talented driving horse and won the "Jon Timmer Driving Award". 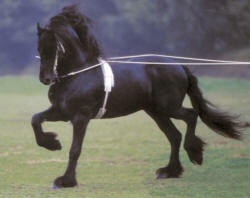 As a sire Remmelt sired very black offspring with luxurious manes, tails, feathers, and very sweet temperaments. He has an impressive 61% 1st and 2nd premie foals. Remmelt passed on nice front ends, correct leg conformation with very good feet. The movement of his offspring is light-footed with rhythm, good extension, very good freedom in the shoulder and strength from behind. Remmelt has one approved son named Tsjipke 399. Remmelt is the son of the deceased Preferent stallion Oege 267, who produced a total of seven approved sons and of his daughters an astonishing 58% became Ster. Oege is known for siring many very good sport horses especially when crossed with mares sired by Hearke 254 Pref., Jochem 259 Pref, and Lammert 260 Pref. This is still true today when these stallion lines are crossed. Oege was sired by the Preferent stallion Wessel 237 and out of the Ster-Preferent mare Wieske. 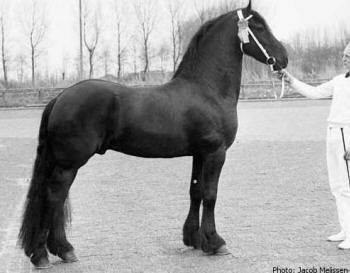 Wessel sired six approved sons, 21 Model mares, and an astounding 74% of his daughters became Ster. Wessel passed on good toplines, strong backs and well muscled hindends. Remmelt is out of the Ster mare Elvira, whose sire was the legendary Preferent stallion Hearke 254 and her dam was the Ster mare Nieske. Hearke had nine KFPS approved sons and he was known for passing on athleticism and majestic movement with suspension. Remmelt is from “Stam” 83, which is a mare line that stands out for fertility. From this mare line, in addition to Remmelt, comes the KFPS approved stallions Gerlof 294, and Olrik 383. “Stam” 83 is known for consistently transmitting quality of gaits. Fimke’s dam is the KFPS Star mare Richt, who was sired by Tamme 276. Tamme was known for spectacular freedom in his shoulder, powerful hindquarters, big extension, huge suspension - as though he had wings, and his love of showing off in front of applauding spectators. Tamme was shown successfully at “Z” Level (Third Level) dressage and was very successful in driving competitions. He passed on to his offspring good Friesian characteristics with good conformation especially in the front end. His offspring have lively movement with big extension. Tamme produced five KFPS approved sons including the now Preferent Leffert 306. Tamme was sired by Jochem 259 Pref, and out of the Star mare Lawine. Jochem produced five KFPS approved sons including the now Preferent Feitse 293, and of his daughters 59% became star. Fimke’s dam Richt Star is out of the Star-Preferent mare Tsjollie, whose sire was Fokke 217 and she was out of the Studbook mare Eelsiena. 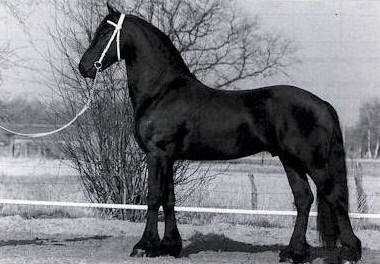 Fokke was sired by the Preferent stallion Ritske 202. Fokke had one approved son named Teake 273 and of his daughters an astonishing 68% became Star. Fimke is from “Stam” 15, which is known for their good gaits, a great amount of breed typical characteristics and golden temperaments. There are 10 KFPS approved stallions that come from this mare line. Fimke’s qualities have been passed down thru generations of superior horses from both her sire and dam. In her pedigree, of the 14 stallions and mares in the first three generations, 5 of those are Star-Preferent and another 4 mares are Star. With all this excellence how could you expect anything else from Fimke’s offspring?